Language is very linear; you have to say one word after the other in order to get somewhere. The good thing about art is that you can say several things at the same time, in many different languages… but it’s still comprehensible. I love it. I have to make a new collage featuring these words. String loops itself onto the page too – very non-linear. The words are from Carsten Holler (sorry – I don’t know how to type an umlaut over the o). And that, my friends, is that. I am daring myself to send you an uncharacteristically brief message. Are you shocked? Surprised? It’s not as if I’m a big rambling talker, although those close to me might disagree. It’s just that the quote and the collage speak for themselves, don’t you think? *The good thing about art is… that there are 999 good things about art. PS Let’s hear from YOU. What’s the good thing about art? 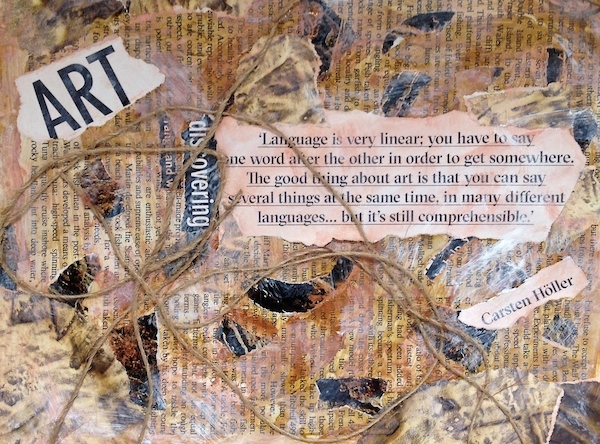 This entry was posted in Creative Inspiration, Creative Process, Seeds and Snippets and tagged Carsten Holler, collage, creative play, language of art by Art and Soul Space. Bookmark the permalink. Sometimes I’d rather just “do” my art than talk. Most of my posts have very little words, that’s why! : ))) I can so relate to this, great post. Thank you, Sandsaltmoon. I might feel heartened and emboldened to create more picture-based low-word-count messages. Inspired by your gorgeous posts. Do what you feel is good for your soul! Excellent suggestion! The sort of suggestion I frequently make to Art and Soulies, and base most of my work upon, but can forget (or struggle) to apply to myself. ; ) wink wink, lol! I know what you mean – it’s human nature, I suppose. Same happens to me with things like that. The good thing about art is…that it opens your mind. Let’s the breeze through. Not to mention that it gets you wondering, thinking, feeling, hoping, questioning. But you have to be willing to be open. Beautifully said, Fiona. Lets the breeze through. Love it. And am impressed that you managed to be concise. I find it hard to limit myself if pressed to only one good thing about art. The good thing about art is I get it. I don’t have to struggle with “Did Sally really mean such and such when she said that?”. I can just look at her beautiful collage and her pithy comment and take a great meaning from it effortlessly. That’s very kind of you, Linda. You are a gem. Wishing you muchly-much effortlessness in your world.